Astra hopes that you are blessed with clear, open skies to see the total solar eclipse of August 21, 2017! Astra's latest article describes the sky during totality on August 21, 2017. Read this and find out what you will see when the daytime sky goes black. Please be sure that your glasses meet the ISO 12312-2 standard. On April 27, 2017 the United State Postal Serve (USPS) announced the issuance of a first-of-its-kind stamp	that changes when you touch it. The Total Solar Eclipse forever stamp, commemorates the August 21 eclipse. The image of the eclipsed sun transforms into the image of the Moon from the heat of a finger. The first day of issue is scheduled for June 20, 1:30 p.m. (MT). A First-Day-of-Issue ceremony will take place at the Art Museum of the University of Wyoming (UW) in Laramie. Getting Ready for the Solar Eclipse. 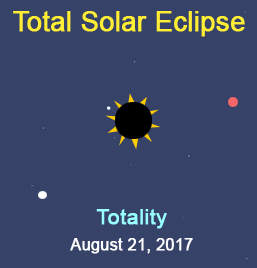 This article provides an excellent overview of the Aug 21 eclipse. Explanations of eclipse phenomena, solar and lunar science, and human reactions to totality are all included in this article. It also discusses the Eclipse Ballooning Project. Project scientists will launch more than 100 weather balloons at various stations along the path of totality. From about 30 km or 18 miles) above the ground the project provide live feeds from a vantage point for those who can’t make it to the eclipse path. The balloons will make scientific measurements as well. In addition to the professionals, more than 50 teams of high school and college students will launch balloons with cameras. The intended audience is student aged 9 to 14, but others may enjoy learning about this eclipse or other technical subjects through this award winning website. Science News for Students publishes daily articles. As an amateur astronomer I love eclipses. Not just solar eclipses, but also lunar eclipses. I have no tally for the number of lunar eclipses I have observed. I only know that the double digits years of this millenium were like living in an eclipse desert from my home location. The first solar eclipse I observed was back in the 70's when I was a kid. In my location, there was only a partial. I have experienced 2 total solar eclipses, each time I wrote up my experiences and they are still available at the Stargate. 1991 Baja California - - About 7 minutes of totality near the centerline. 1994 Waseoun, Ohio - - Annular eclipse from the centerline. Here's some information for observing the eclipse from the Cleveland, Ohio area. Your story or link could appear here! Use the contact page to send a message to the Gatekeeper. Astra loves collaborations with eclipse chasers, amateur astronomers, and others. Send in your links or provide information that can be incorporated into Astra's Guide to the Total Solar Eclipse August 2017. Each state has its own section and we will be happy to include your event on our site if appropriate. Use our contact page for mailing information.